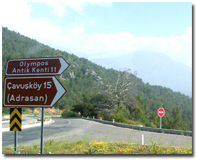 The Bey Dağlan (Olympos) National Park, Topçam Beach and camp grounds, are at the north end of the park. They are perfect for a visit, and for enjoying a view of the strangely perpendicular Sıçan lsland. The mountain resort of Saklıkent, 50 km from Antalya, is an ideal winter sports center on the northern slopes of Bakırlı Mountain at an altitude of 1750-1900 m. March and April are perfect for skiing in the morning, then in the aftenoon you can go to the marina for a lunch of fresh fish, and end the day sunbathing on the beach, swimming or windsurfing. On the eastern side of Çan Mountain, 30 km from Antalya, there is the Karain Cave, dating from the Paleolithic Age. This the site of the oldest setttement in Turkey. The cave has a single entrance, lit by the morning sun, then moves into three large interconnecting chambers. The little museum at the entrance has some artifacts from this historical site. 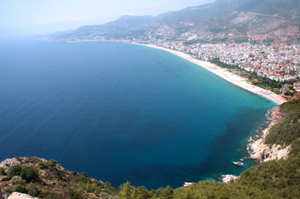 In Düzlerçamı Park, 20 km north of Antalya, deers and moutain goats are among the species that are protected by World Organizations. The Güver Canyon which is 3 km south of the park is 115-meter-deep and is worthed to see. 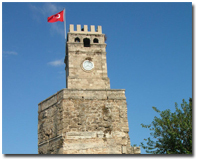 Some of the best shopping may be found in the Kaleiçi district, near the city walls. Wondering down through the side streets in the old quarters it is possible to find anything your heart desires. Old Turkish kilims, original gold jewellery, leather products, natural cotton clothing, handmade wooden items as well as traditional Turkish handicrafts are among the many items that you will be able to find. Atatürk, Cumhuriyet and Işıklar are the three other shop­ping avenues. Don't miss the colorful open air vegetable and fruit market. It is a great location for grocery shopping.